A group exhibition of printmaking and ceramic works accompanied by sculptural objects and antiques. Jake Cassevoy (ABOVE) graduated with a BFA in printmaking from Montserrat college of art in 2011. His work has been exhibited at Rocky Neck Artist Colony in Cape Ann, MA and 17 Cox Gallery in Beverly, MA, as well as group shows Montserrat Alumni. 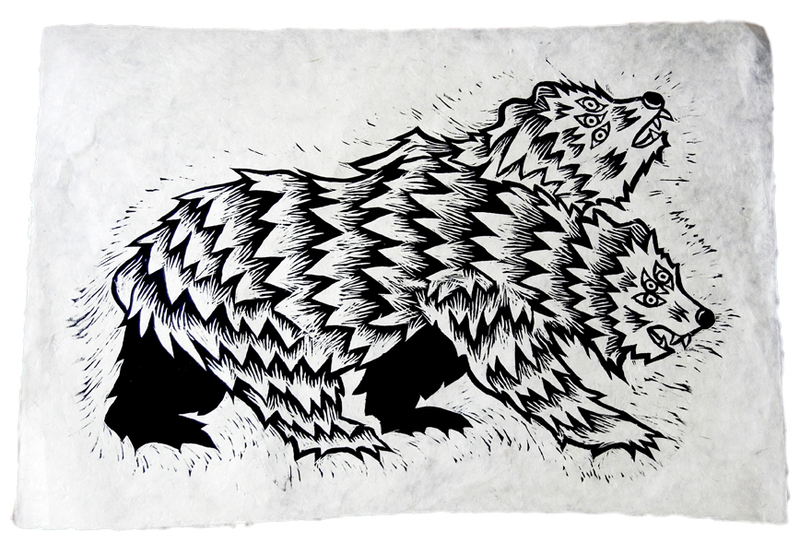 His newest series includes folk inspired animal woodblock prints and is currently in production. "BA KU," his previous series of works depict grisly shadow puppet characters. Both series are on exhibit here at the Gallery at Chases in Prints & Pots, an exhibition of local printmaking and pottery. Of the printmaking processes Cassevoy uses he explains, "I like working on woodcuts and relief prints because of the technical skill involved... the process allows for a closer relationship to the work." Cass has won a National Endowment for the Arts Fellowship and three awards from the Illinois Arts Council for his work, which combines religious imagery and a folk art style. His work is represented in the collections of several museums, including the Krannert Art Center in Champaign, Illinois and the Madison Art Center in Wisconsin. He is currently a full-time printmaking teacher at the New Hampshire Institute of Art, Manchester. Dust Jacket. Minogue, C., & Sanderson, R. (2000). Wood-fired Ceramics: Contemporary Practices. University of Pennsylvania Press. Mary Sweeney's pottery was fired in a "Groundhog" Bourry-box kiln in Norridgewock, Maine. The wood kiln is stoked for 60 hours around the clock and burns almost two cords of wood. After a week of cooling the door is open to find the treasures within. There are always surprises and no pieces alike. Sweeney has found her passion working in clay where she can create beauty in both form and function. It gives her great joy to create pieces that can become a regular part of people's lives that are also works of art. By throwing pieces on the wheel, she creates a clay "canvas" on which she can add texture and color with carvings, stamps, slips and glazes to enhance its form. Each piece is unique and she delights in the infinite possibilities found in decorating. Tyler Gulden is a ceramic artist, art educator and administrator. He studied ceramics at Alfred University and University of Massachusetts Dartmouth and has been a resident artist at notable craft centers like Peters Valley Craft Center, Haystack Mtn School of Crafts and Watershed. A ceramic artist, arts educator and arts advocate, he has conducted workshops throughout Maine for children and adults, in addition to professional development workshops for teachers and artists, through the Watershed Mudmobile program. Other teaching includes workshops and lectures at Bowdoin College, Tabor Academy, Maine College of Art, Portland Pottery, and a position as Lecturer in Visual Arts and Culture at Bates College. Tyler worked for 12 years in arts administration at Watershed Center for the Ceramic Arts in Newcastle, Maine ending his tenure as Executive Director in October 2012. Gulden's functional ceramics are exhibited internationally in group and juried exhibitions. His current work follows the tradition of salt firing, in combination with the more contemporary process of soda firing, capitalizing on the unique color and surface variations that are a natural product of the process. For more words on Tyler's firing process check out his artist page.